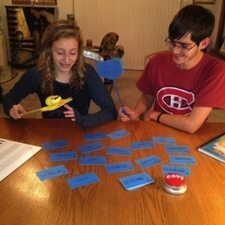 Flashcards and Flyswatters - Make learning fun! Who knew Flashcards and Flyswatters could make studying so much fun! Every Ultimate Music Theory Workbook contains 80 FREE Flashcards. The color coded Flashcards match the cover of each workbook, for example the Intermediate Workbook Flashcards are Blue. 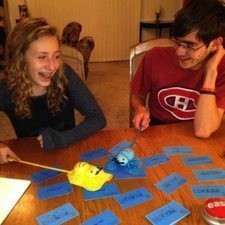 So what's up with Flashcards and Flyswatters? Flyswatters are awesome. They can be used to get rid of nasty flying (or crawling) critters that invade your teaching space. They can be used to create a small breeze if the air conditioner dies. They can also be used to study for your student’s Theory Examination. Whether working one on one in a private Theory Lesson or in a Theory Group, nothing perks up a lesson faster than bringing out the Flashcards and the Flyswatters! Here's a great UMT Game called Flashcard Slap. Slap can be played with any level of flashcards. 1) Give each student a Flyswatter (and a warning to not slap anything but the Flashcards with them). 2) Spread out a dozen or so Flashcards on the table. They can be concept specific (for example, all the Staff Notes or all the Key Signatures) OR they can just be random Flashcards. 3) Ask the students to “Slap the Flashcard that…”. This game can be “reward-based”: First Student to slap the correct Flashcard gets a “treat” – have a bowl of cheerios or raisins or pretzel sticks as the “treat” (you can also get gluten-free treats at your local bulk store). This game can be “EASY”: First Student to slap the correct Flashcard gets to also slap the “Easy” Button. This game can also be non-competitive: Everyone just gets a “cheer” when they slap the correct Flashcard. Flashcards can stay on the table or, when correctly “slapped”, they can be put at the bottom of the deck and a new Flashcard can replace it. Slap the Flashcard that means to play sharply detached (staccato). Slap the Flashcard G in the Treble Clef. Slap the Flashcard that shows the Key Signature of G Major. Slap the Flashcard for the note that is a Perfect 5th above C.
Slap the Flashcard that shows the Key Signature of the Major Key with D as the Dominant Note. With exam time coming up, invite your Theory Students to a “Slap Party”. All Learning Styles – Visual, Auditory, Kinesthetic and Special Needs – will benefit from playing Slap. Ask each parent to provide a sharable treat – you will provide the Flyswatters. Take a picture of your “Slap Party” and email it to [email protected] and we will put it in an album on our Ultimate Music Theory Facebook Page. Want More Game Ideas? Yep a roonie! The Ultimate Music Theory Certification Course will provide you with lots of Flashcard Game ideas as well as detailed lesson plans for Basic, Intermediate and Advanced Rudiments - perfect for teaching private and group lessons.